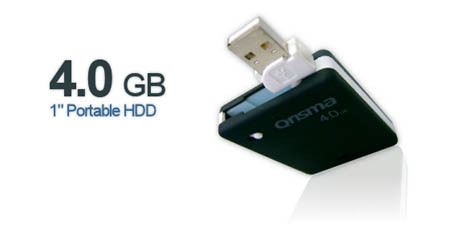 Ruggedized Portable HDD From Qrisma | OhGizmo! Well, a portable hard drive is a portable hard drive. But when the price is right, and the features just so, maybe you call it a good deal. Take the recently announced 4GB ruggedized Portable Hard Drive from Qrisma. With transfer speeds of 480Mbps, anti-vibration and heat -dispersion abilities, rubberized casing and a swiveling USB 2.0 connector, all priced at around $100… well, it doesn’t sound too bad. With dimensions at 64mm x 51mm, it’s actually portable enough to make it into a big keychain.